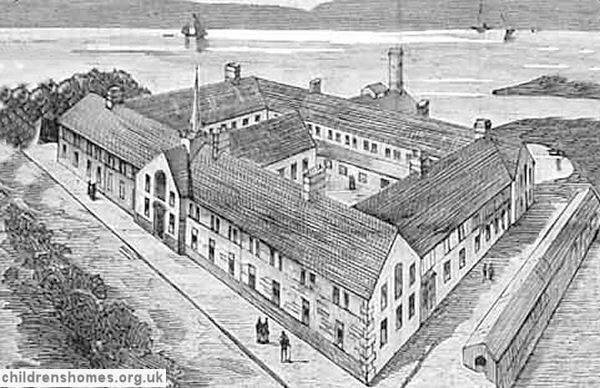 On 1887, the Baltimore Fishery School, also know as the Fishing School or Piscatorial School), an Industrial School for Roman Catholic Boys was opened in 1887. The School was intended to teach boys fishing, the curing of fish, and related skills such as net-making and boat-building. The project, which was mooted as early as 1870, by Sir Thomas Brady, Inspector of Fisheries, largely owed its realization to the great interest taken in the locality by the Baroness and Mr. Burdett-Coutts, M.P., who were given considerable practical assistance by the Rev. C. Davis. The establishment was formally certified to begin operation on 12 August 1887. Following construction of an extension to the buildings, it could accommodate 150 boys. The School was run by the Brothers of Charity. A sketch of the School published in 1887 bears only a limited resemblance to the building's footprint as shown on later maps, so some artistic licence may have been taken. Baltimore Fishery School site, Baltimore, early 1900s. With a year of the School's opening, large quantities of cured fish were being exported to America. An inspection in 1911 noted that the staff comprised the manager, Rev. Brother F. McCarthy, assisted by three schoolmasters, bandmaster, fishery instructor, net instructress, boat builder, gardener, night watchman, laundress, two tailors, matron, and domestic servant. A large play-hall had recently been erected and a large shed, costing about £2,000, was nearing completion for the building and repairing of boats. Six boats had been built the previous year in the school-yard, four of them being large boats for deep-sea fishing. A good number of boys were sent out in turn in the school fishing boats. There were 110 boys engaged at net making, sail making, and fishing. There were also 6 boat builders, 25 tailors, and 8 agriculturists. The School's band frequently performed at local public functions. The bandmaster also instructed the boys in drill. The School closed in 1950. The buildings no longer survive.